Congrats to you. I love reading your blog. You’re welcome! It’s much deserved. And I’m envious of you for being able to read without getting motion sickness! I can read for a few minutes, but any longer than that and I start to feel queasy. Sorry. I wouldn’t enjoy long car rides without a book or my journal but I know it isn’t possible for everyone. Thanks again. Thanks and congrats. It must have been all the shoes recently. They speak to me. Enjoy. It is something we have in common! Congratulations! 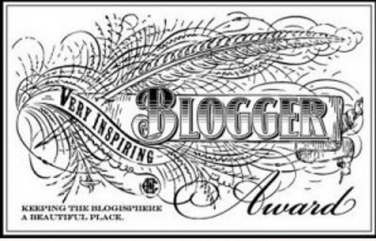 You really deserve this – and thank you so much for the nomination!!! Thank you. Congrats to you. Enjoy. Looks like we have a lot in common and I’ll keep your secret if you keep mine. LOL. Thanks and congrats to you. Thanks and congrats to you. I don’t use the trivia but I am sure it would be dangerous for me to start. What is the obsession we have with “famous” people? Oh well. There are worst things. Nothing wrong with different. Thankfully, we all are unique and it keeps life fun.